Time is usually - nearly always - displayed by a circular indication: one dial and two (or three) with the time displayed around a perpetual circle. However, this 360° representation of time goes against everything we learnt as we grew up drawing a straight line on a blank page and marking it Past, Present and Future. Why do we think of time as travelling in a straight line yet display it rotating around a circle? The answer is straightforward: mechanisms that continually rotate are much simpler to produce than those that trace a straight line then return to zero. In fact, the latter is so difficult that, until now, nobody has ever managed to develop a production wristwatch with true retrograde linear displays. On the UR-CC1, there are two horizontal indications displayed by two retrograde cylinders: one for the (jumping) hours, the other for the minutes. And don't be lulled by the apparent simplicity of the displays; the UR-CC1 is the result of more than three years of research, development, production and testing to ensure that the rotation and instant fly-back of the large hour and minute cylinders was achieved without compromising accurate timekeeping. A vertical triple-cam operating a toothed rack (visible through a window in the side of the case) rotates the minute cylinder. From zero to 60 minutes, the minute cylinder rotates through 300°. On arriving at the 60-minute mark the cylinder instantly (1/10th of a second) reverses back to its original position thanks to an extra-flat linear spring. The retrograde movement of the minute cylinder triggers the hour cylinder to advance (jump) one complete hour. The triple-cam is crafted from bronze beryllium, a metal selected for its inherently self-lubricating properties and low co-efficient of friction, and takes the form of three small inclines. The precise shape of the curve of the incline is relayed to the pivoting rack, while the teeth on the end of the rack mesh with and rotate the minute cylinder. The triple-cam makes a complete rotation in three hours so that each of the three inclines takes 60 minutes, and 180 points of reference have been calculated on each of the three cams to ensure the precise and isochronic rotation of the minute cylinder. first appear contradictory: absolute rigidity, so as to accurately transmit the motion of the cam to the minute cylinder; and extremely low mass to consume as little energy as possible and minimise the effects of gravity and accelerations/shocks. This vital component has been fabricated by Mimotec using their photolithography process. The honeycomb pattern of the structure resolves the two apparently contradictory requirements of maximum strength and minimum weight. The dial of the UR-CC1 is animated by a rotating disk displaying the seconds both digitally and linearly – a world first! This incredible exploit was achieved thanks to Mimotec’s photolithography production technique; the procedure is even more precise than electro-erosion. To reduce mass to an absolute minimum, the minuscule numerals were even skeletonised. 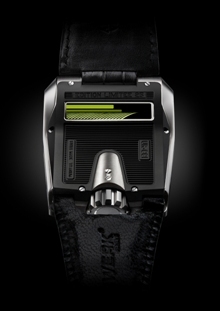 A small tab at 10 seconds bearing the URWERK logo precisely counterbalances the disk's single-digit numbers. This marvel of micro-precision weighs only 0.09 grams. UR-CC1 features URWERK’s pneumatic shock-absorbing Rotor Fly Brake automatic winding system, which minimizes rotor and mechanism wear and damage from shock and harsh movements. The operation of the Rotor Fly Brake is visible through a window on the side of the case. Messrs Gilbert Albert and Louis Cottier combine their talents to create a watch destined to revolutionize the horological world. 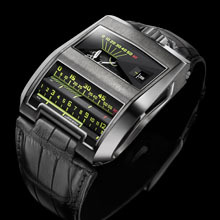 Their idea is completely outrageous: it is the world’s first watch to feature a linear display. It is an extraordinary, avant-garde piece that fulfils none of the aesthetic criteria of the time. As for its linear indication, the idea may seem simple but the execution is a technical headache of monumental proportions. However Messrs Albert and Cottier believe in it and they stick with it, creating a prototype for Patek Philippe. A patent is deposited by Louis Cottier, detailing the technical scale of the achievement. Then – nothing. The prototype is put on to one side. Does the watch even work? Today nobody knows for sure. It took its place in the corner of the Patek Philippe museum and proceeded to arouse curiosity from time to time. master watch-maker and co-founder of URWERK, another idea springs to mind – the concept of the hour satellite, presented for the first time at Basel. The earlier project is postponed, sine die. in which orbiting hour satellites indicate the minutes. But the idea of developing a different way of telling the time continues to fascinate Felix Baumgartner. In the end it is the Alfred Hitchcock film “The Birds” that gives him the decisive nudge in the right direction. In one of the most famous scenes from the film, the heroine seeks refuge in an old Dodge. The image lasts only a few seconds but it is crucial – a close-up of the dashboard and its linear speedometer. Yes. That’s it! A continuous line with which to mark time. Felix and Martin work non-stop on this new project. Their research leads them to the discovery of Gilbert Albert and Louis Cottier’s watch. It will be their “muse”. Three years of research. One year of testing. URWERK’s “King Cobra” is unveiled. ‘CC’ for Cottier Cobra, a homage to the genius of Louis Cottier, inventor and creator. 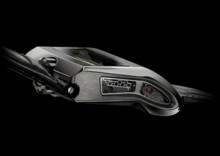 Once more, URWERK redefines our vision of fine watchmaking and pushes back the frontiers of the possible. I am interested in the perception of time. Physicists tell us that time can be warped or stretched, and our daily experiences are with the circular cycles of the days, seasons and years. But I am also intrigued that time can be ordered, even straitjacketed, to flow in a linear direction - a straight line from the past, through the present, to the future. And, because this can represent an individual’s lifeline, I feel that this linear format can be a very human way to look at time. That plus the fact that I think it looks really cool ! I am not big on nostalgia, but I have always loved the linear speedometers found on old cars. My older brother had a 1960’s Volvo and it was that which gave us the first idea for a horological linear indication. I recently watched the film ‘The Birds’ by Alfred Hitchcock, and in it the heroine took refuge in an old Dodge with a linear speedometer- it is one of my favourite scenes. There are very few wristwatches with linear indications. One of them, if not the first, was ‘The Cobra’, which was developed in the late 1950s by Mr. Louis Cottier. It is sensational! Although it was created over half a century ago, it is still very contemporary. Unfortunately, it only exists as a single prototype and was never put into production. Now, 50 years after he filed his patent (1959), URWERK pays homage to the work of Louis Cottier by creating its own interpretation of the Cobra.